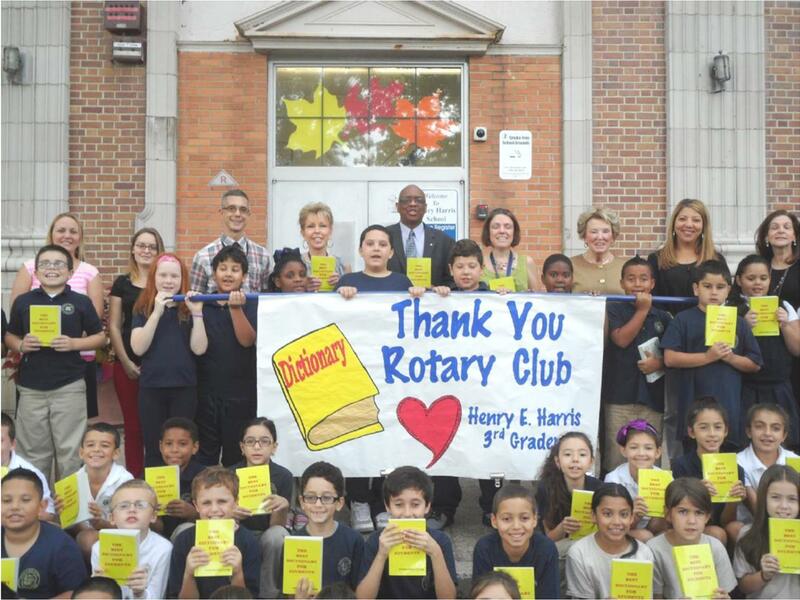 Bayonne Rotary has been distributing personal dictionaries to Bayonne’s third graders in every public and private school for the past 14-years because reading is the most important skill of all. Reading and the word knowledge it brings is the starting point for all the economic and social opportunities this world has to offer. Educators such as Supt. of Schools, Dr. Patricia McGeehan – also a Rotarian – see third grade as the dividing line between learning to read and reading to learn. Bayonne Rotary as part of Rotary International is a major sponsor of the Dictionary Project. The Dictionary Project is a 501(c) (3) nonprofit organization. The goal of this program is to assist all students in completing the school year as good writers, active readers and creative thinkers by providing students with their own personal dictionary. The dictionaries are a gift to each student to use at school and at home for years to come. The Dictionary Project gives 95 cents of every dollar donated toward the purchase of dictionaries. The Dictionary Project Sponsors such as Rotary are part of a tireless effort to improve literacy and the quality of life in their communities. These volunteers are the breath of life of The Dictionary Project. Through The Dictionary Project, people feel empowered to affect change and improve education so that the children will grow up better prepared to compete in the global economy. The idea for the Dictionary Project began in 1992 when Annie Plummer of Savannah, Georgia gave 50 dictionaries to children who attended a school close to her home. Mary French, a Rotarian and former school secretary, admired Annie’s work and took up the crusade in Charleston, South Carolina. Under Mary’s leadership, Annie’s idea has developed into The Dictionary Project, a nonprofit organization. Since Annie’s death in 1999, millions of children have received dictionaries because thousands of people saw the same need in communities all over the United States. Rotary International believes that “Kids who read succeed”. • Five to six year olds have a vocabulary of 2,500-5,000 words. • 33% of children in California will not finish high school. • Disadvantaged students in the first grade have a vocabulary that is approximately half that of an advantaged student (2,900 and 5,800 respectively). • The average student learns about 3,000 words per year in the early school years (8 words per day). • 14% of all individuals have a learning disability. 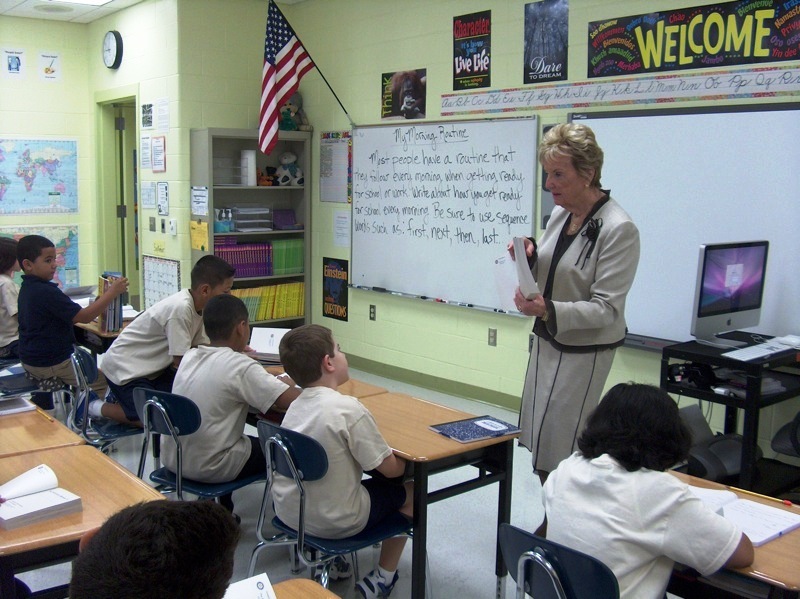 • 54 percent of all teachers have limited English proficient (LEP) students in their classrooms, yet only one-fifth of teachers feel very prepared to serve them. • The educational careers of 25 to 40 percent of American children are imperiled because they don't read well enough, quickly enough, or easily enough. • It is estimated that more than $2 billion is spent each year on students who repeat a grade because they have reading problems. • Since 1983, more than 10 million Americans reached the 12th grade without having learned to read at a basic level. In the same period, more than 6 million Americans dropped out of high school altogether. • Over 50% of NASA employees are dyslexic. They are deliberately sought after because they have superb problem solving skills and excellent 3D and spatial awareness. • Over one million children drop out of school each year, costing the nation over $240 billion in lost earnings, forgone tax revenues, and expenditures for social services. • It is estimated that the cost of illiteracy to business and the taxpayer is $20 billion per year. Reference: United Way, "Illiteracy: A National Crisis"
• More than three out of four of those on welfare, 85% of unwed mothers and 68% of those arrested are illiterate. About three in five of America's prison inmates are illiterate. • Approximately 50 percent of the nation's unemployed youth age 16-21 are functional illiterate, with virtually no prospects of obtaining good jobs. • 44 million adults in the U.S. can't read well enough to read a simple story to a child. • Dyslexia affects one ot of every five children - ten million in America alone. • U.S. adults ranked 12th among 20 high income countries in composite (document, prose, and quantitative) literacy. Reference: According to a separate report released by the Educational Testing Service. • More than 20 percent of adults read at or below a fifth-grade level - far below the level needed to earn a living wage. • Children who have not developed some basic literacy skills by the time they enter school are 3 - 4 times more likely to drop out in later years. • Nearly half of America's adults are poor readers, or "functionally illiterate." They can't carry out simply tasks like balancing check books, reading drug labels or writing essays for a job. • 21 million Americans can't read at all, 45 million are marginally illiterate and one-fifth of high school graduates can't read their diplomas. • To participate fully in society and the workplace in 2020, citizens will need powerful literacy abilities that until now have been achieved by only a small percentage of the population. • 15 percent of the population has specific reading disorders. Of these 15 percent as many as 1/3 may show change in the brain structure. Reference: Albert M. Galaburda, M.D., Beth Israel Hospital, Harvard Medical School. • It is estimated that as many as 15 percent of American students may be dyslexic. • There are almost half a million words in our English Language - the largest language on earth, incidentally - but a third of all our writing is made up of only twenty-two words. Reference: Paul Kropp "The Reading Solution"
• 46% of American adults cannot understand the label on their prescription medicine. • In a class of 20 students, few if any teachers can find even 5 minutes of time in a day to devote to reading with each student. • 56 percent of young people say they read more than 10 books a year, with middle school students reading the most. Some 70 percent of middle school students read more than 10 books a year, compared with only 49 percent of high school students. • 15% of all 4th graders read no faster than 74 words per minute, a pace at which it would be difficult to keep track of ideas as they are developing within the sentence and across the page. • Forty-four percent of American 4th grade students cannot read fluently, even when they read grade-level stories aloud under supportive testing conditions. • 50 percent of American adults are unable to read an eighth grade level book. • Out-of-school reading habits of students has shown that even 15 minutes a day of independent reading can expose students to more than a million words of text in a year. • The average reader spends about 1/6th of the time they spend reading actually rereading words. Reference: No reference information is available for this statistic. • Students who reported having all four types of reading materials (books, magazines, newspapers, encyclopedias) in their home scored, on average, higher than those who reporter having fewer reading materials. • Good readers in 5th grade may read 10 times as many words as poor readers over a school year. • In 1999, only 53 percent of children aged 3 to 5 were read to daily by a family member. Children in families with incomes below the poverty line are less likely to be read aloud to everyday than are children in families with incomes at or above the poverty line. • According to the 2003 National Assessment of Educational Progress (NAEP), 37 percent of fourth graders and 26 percent of eighth graders cannot read at the basic level; and on the 2002 NAEP 26 percent of twelfth graders cannot read at the basic level. That is, when reading grade appropriate text these students cannot extract the general meaning or make obvious connections between the text and their own experiences or make simple inferences from the text. In other words, they cannot understand what they have read. • When the State of Arizona projects how many prison beds it will need, it factors in the number of kids who read well in fourth grade. • First grade children with good word recognition skills were exposed to almost twice as many words in their basal readers as were children who had poor word recognition skills.